The Curvy Copter+ is the next step up from the regular Curvy Copter. 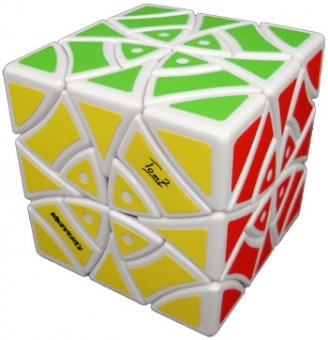 The Curvy Copter is a so-called jumbling puzzle: a puzzle that behaves like a bandaged cube, but can never be fully "unbandaged". The Curvy Copter+ is the result of applying some unbandaging to the Curvy Copter, creating 24 additional face pieces that can interchange with the corner pieces. The curved cuts create beautiful patterns but for some people it is even a puzzle in itself to figure out what all the possible moves are.The Curvy Copter+ uses the unique patented 12 spindel Helicopter core designed by Adam G. Cowan. For the fish eyes they have been die cut but are almost invisiable so you need to use a small pin or needle and remove the 4 fisheyes from each side if you prefer that appearance as per the photo.